Yes, I did use a line from a Backstreet Boys song in my title. Deal with it. I went to Puck Drop today. Hockey is back my friends! – Got to the arena at about 930 and found seats in Section 105. I know it’s supposed to be cold in the arena, but holy moses, it was cold in the arena. I was wearing uggs, jeans & a sweatshirt and I was still cold. I wish I would have brought gloves as my hands were freeeeeeezing. – The seats in this section (or maybe just my row) looked like they could use a good steam cleaning. They were kind of spotted and gross looking. – For every one well behaved and considerate child I saw, there had to be at least three hellions. The worst offenders were the woman who sat in the row in front of me and let her three children (all under the age of 6 or so) use the two rows as their own personal jungle gym. She was trying to keep them under control, but it really wasn’t working. Thank god she left before the jersey unveiling or I would have been angry with her little monsters. – During the practice session, Lindy called huddles repeatedly to explain plays in the whiteboard. The players all look like Lindy is attempting to explain nuclear physics to them rather than basic hockey plays. – The Adult Street Hockey tournament was going on outside the arena. The best team uniform that I saw was worn by a group of gentleman who called themselves the Buffalo Rangers. 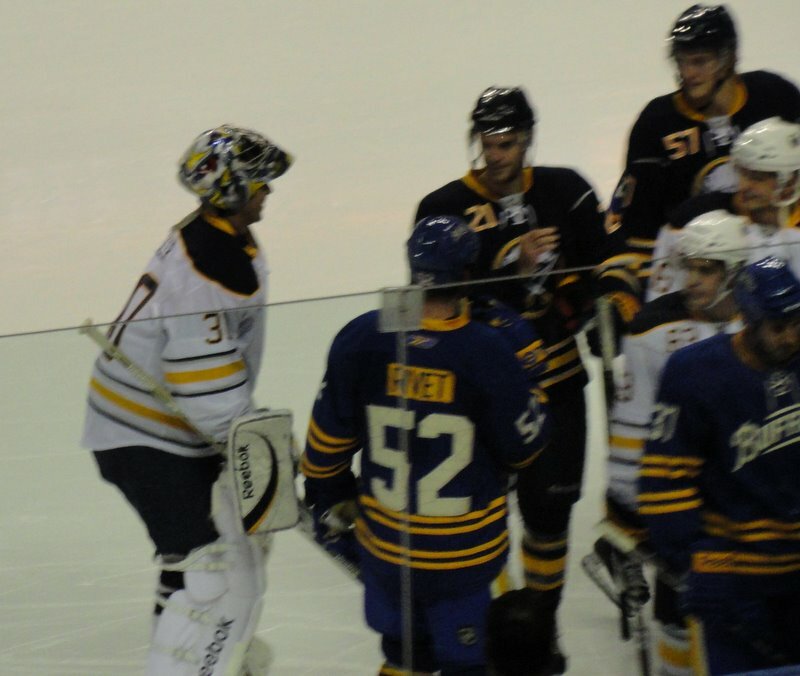 Each of their sweaters had a departed Sabre on the back: Kennedy, LaFontaine & Drury. These guys get the award for both creativity & snark. 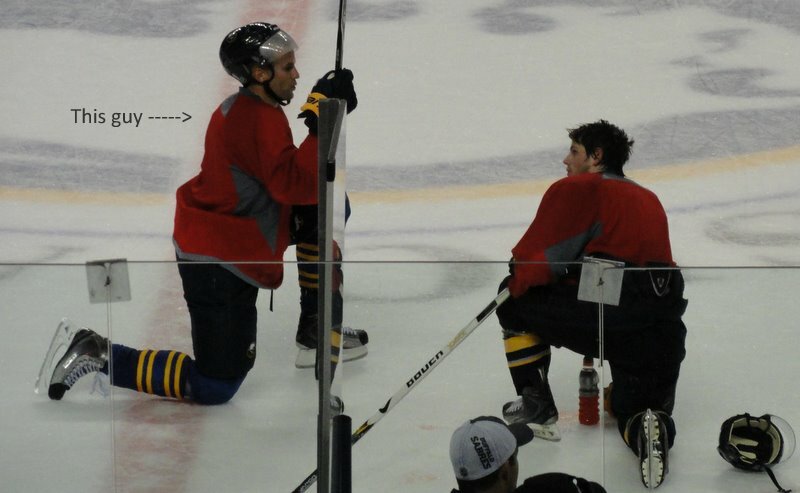 At one point, Gaustad and Myers (I think) were standing at the bench entrance in their undergear and watching the practice. One word from Lindy and they turned tail and ran back into the locker room. It was pretty funny, like they got scolded by dad and were headed to their room to serve out their punishment. Another player briefly came out, munching on a banana, but soon left. At least I THINK this is Goose and Myers. Suggestions welcome on whom else it could be. Updated to say that I’ve been told that it’s Kassian. Thanks Mike! 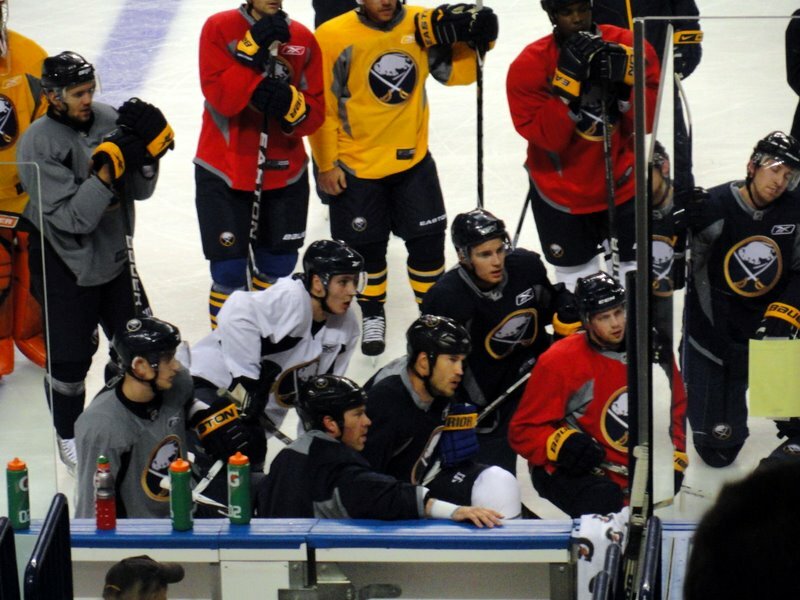 – Lindy was quite vocal during the drills, with Roy-Z, Montador and Gerbe getting some name attention. – There was Pominville graffiti in ladies room. I’m sure whoever thought it was a great idea to write Pominville’s name in a heart in a ladies bathroom stall clearly never thought it through, that the object of her affection would never get to see her adoration for himself. – The smell of pizza & hot dogs at 10am is kind of repulsive. Same thing with the overly yeasty smell of beer fresh from the tap. But if that’s your thing who am I to judge? 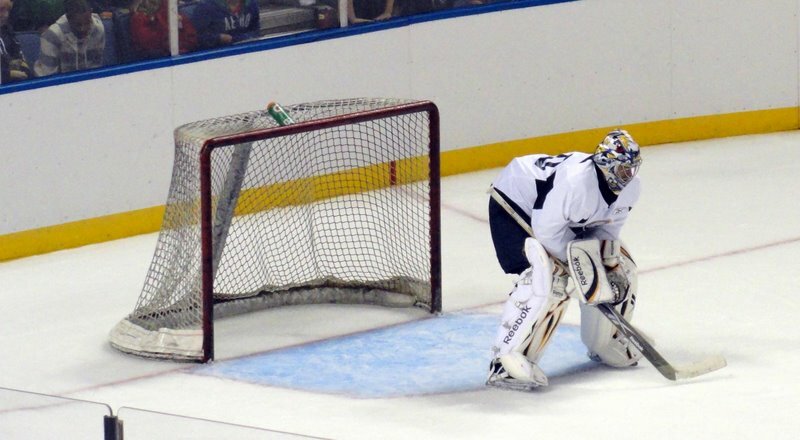 – Montador blocked a shot and stayed down on the ice on all fours for a bit, then moved to the bench to shake it off. That shot looked like it hurt. I know the red guy is someone completely obvious, but it’s annoying me that I can’t figure out who it is! – Has Lindy always made players do push-ups on the ice after drills? At one point, there were four or five different players doing push-ups on the ice. 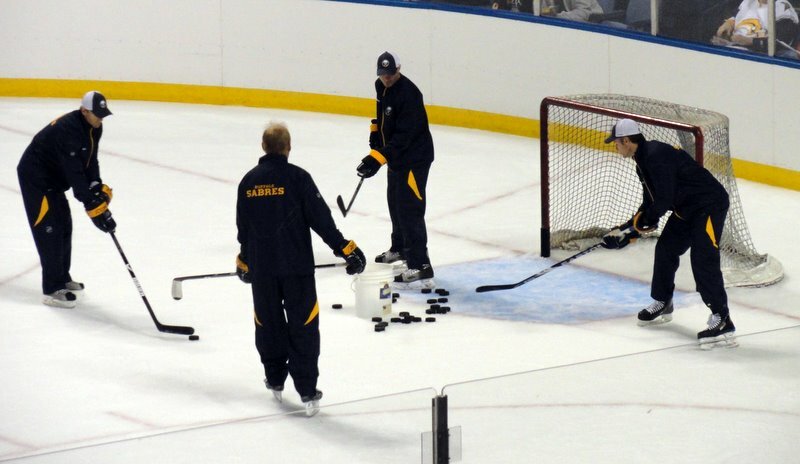 – While the Zamboni was prepping to come out, the coaches were “helping” to remove the pucks from the ice by flipping them into a bucket with their sticks. Their aim…not so good. They looked to be having a great time doing this, until the Zamboni appeared and ruined the fun. – The new sweaters look sweet. It’s so good to see the white sweaters back out on the ice this year. I hope this isn’t a one year only thing, and that the slug is dead and buried for good. Even the ‘Tooth got in on the fun! Staffy! 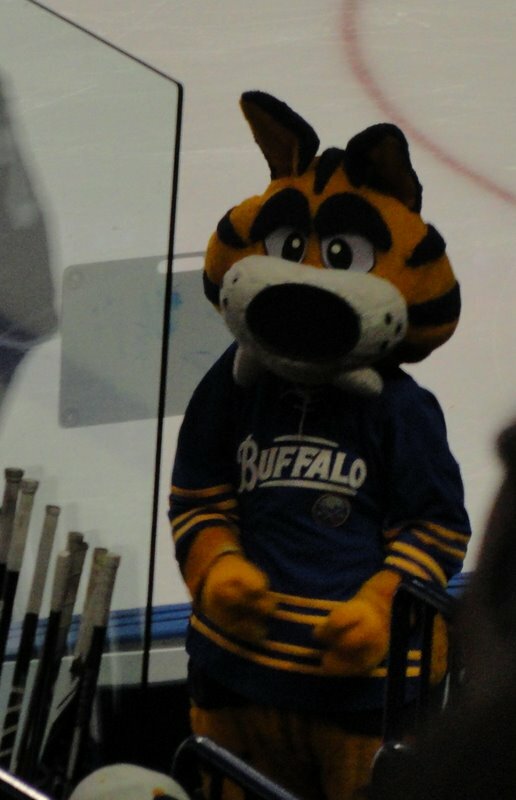 He better come down with a massive case of contractyearitis, or his time in Buffalo could be coming to an end. – Watching the scrimmage after the reveal was fun. It was actual hockey played by actual hockey players! Who cares if nothing but pride and a spot on the team is on the line. For the fans, it was great to see. 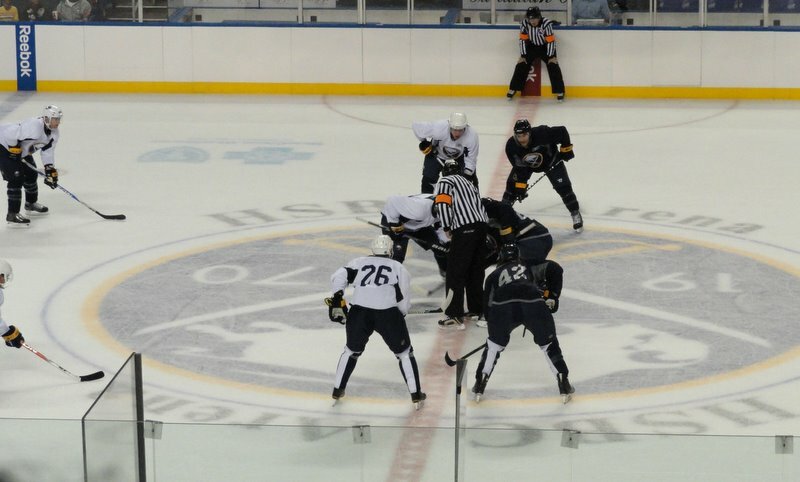 – Nice nod to history with the names of the two teams for the scrimmage. I think they would be proud. Here we have species Crunchious Goaltenderous in his natural environment. – All in all it was a good day. 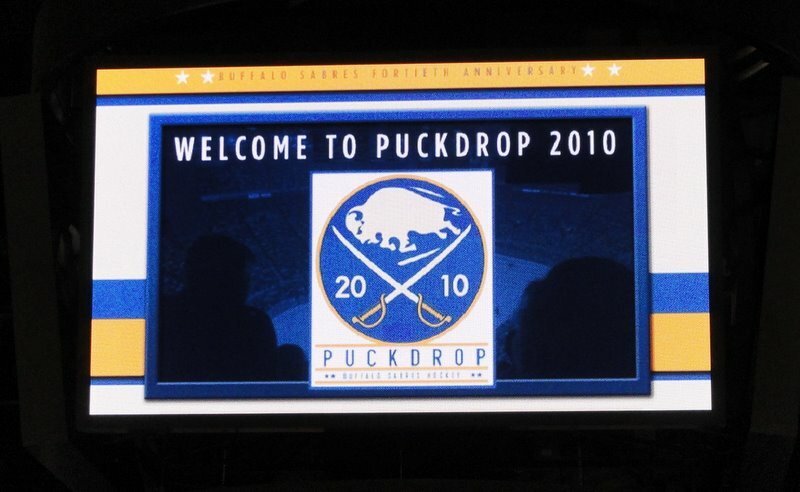 I did buy a new t-shirt at the Sabres store (the blue one with the logo script) and a set of fridge magnets. The cynical part of me knows that the team is making money hand over fist today because of the new gear, but the stuff does look great. 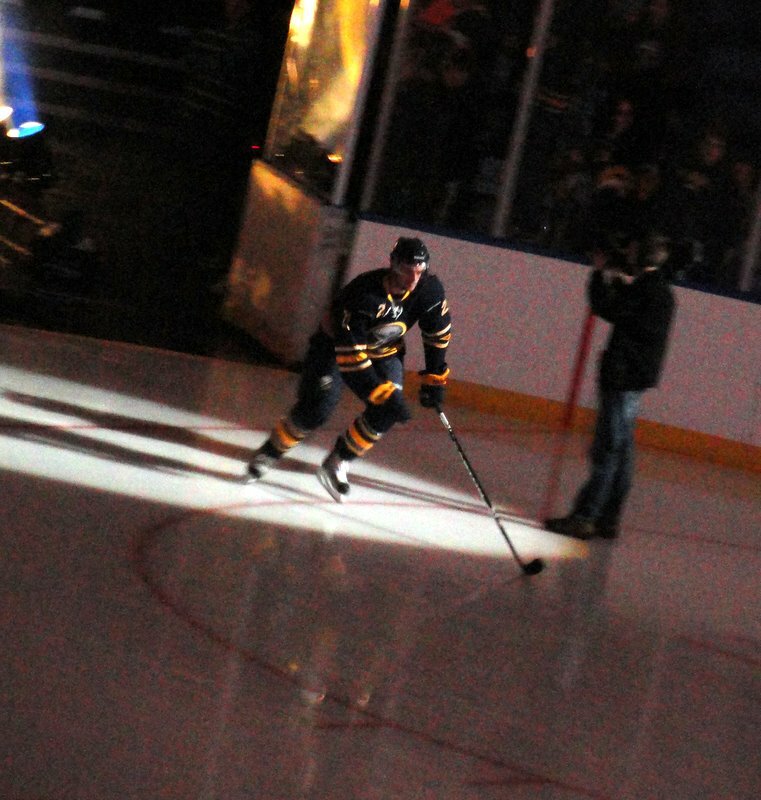 I went to Puck Drop today, and this wordy, photo filled post summarizes my day. Carry on at your own risk. – Lindy saying he keeps his skates on around Tyler Myers to avoid being intimidated. While I doubt the tall little Baby Sabre could intimidate Lindy, Tyler has to be gargantuan on skates. – I was watching the Channel 2 News, and the sportscast featured some footage shot by Adam Begnini. Well, Zach Kassian was making like the hard charging player he is, and next thing you know, DOWN GOES BEGNINI! Both Begnini and the camera were alright, but I like that Kassian is showing fire and brimstone right away. – It’s not Sabres related, but the NHL Twitter feed was sharing updates from player interviews being conducted for their new social networking site. In case anyone cares, Sidney Crosby’s favorite Mighty Duck is Charlie Conway. Aww, Charlie. He grew up into quite a nice little mallard…if you know what I mean. Posluszny owns a computer but he doesn’t have a laptop, so he doesn’t have that for a diversion at camp, either. He’s resorting to old-fashioned media to get away from football; he’s reading a book. “I’m in the middle of a pretty good book right now, ‘Guns, Germs and Steel.’ It’s about why certain cultures, particularly the Europeans,developed the way they did,” he said. The book, by Jared Diamond, won a Pulitzer Prize in 1998. That’s not something you read – or even gain an interest in – in the simple classes that most collegiate athletes are shunted into. Seriously though, how many collegiate athletes are involved in athletic training / physical education / exercise science / general studies programs? I realize that those programs are the ones that usually co-exist the most peacefully with an athlete’s schedule, but what happens when they enter the real world (either instead of or after a professional career)? A physical education degree will only get you so far. You are currently browsing the archives for the Campy Goodness category.